The moment you pull into the driveway of 27 Blue Dolphin Court, otherwise known as Clair de Lune, you’ll notice this vacation house towers well into the sky. 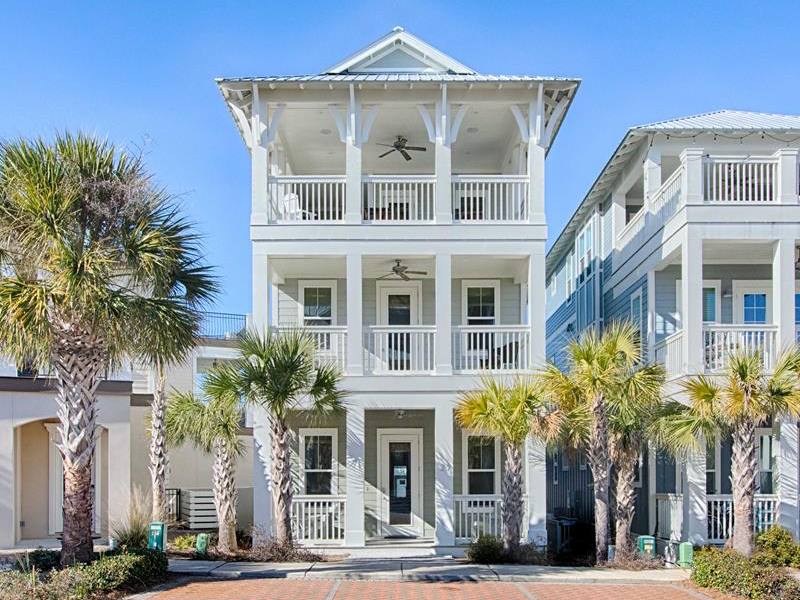 This three story splendor, located in the 30A area, is prepared to leave you in awe. With chic designer furnishings contemporary design, and luxurious, beachy decorations, you’re sure to be in awe the moment you walk in. Cool, beachy hues draw you into the spacious living room where comfortable furniture focus around a flat screen television, and beach decorations comfortably fill the room. As you proceed in towards the kitchen, you’ll see the granite countertop extends into a breakfast bar, and you’ll see a matching style on the opposite side of the kitchen. The kitchen between the two breakfast bars has a plethora of granite countertop space, wooden cabinets, and stainless steel appliances, and every utensil you need to make a feast. The food you cook in the kitchen will go well to populate the enormous dining table, complete with six chairs to gather everyone around. The half bath features the same chic design as the rest of the floor and a porcelain water basin as a sink. Moving up to the second floor, you’ll find the first two bedrooms, sporting the same chic design as the rest of the house. Featuring large flat screen televisions and enormous and comfortable beds, these bedrooms are truly something to behold. With hardwood floors, beachy decorations, and comfortable mattresses, you’ll feel truly delighted to stay here. The bedrooms also have their own balcony that you can step out onto and enjoy a sunrise or a sunset. Both bedrooms have an ensuite bathroom with walk in showers with glass doors and the same beachy design as their attached bedrooms. One of the baths also has a tub for relaxing in. On the third floor is a room perfect for kids. Twin bunk beds provide a place for 4 people to sleep, and the third floor also has its own balconies you can walk out on to in the front and the back of the house. There is also an upstairs living room with an enormous television and a massive couch that can fit everyone on. The third floor also has a summer kitchen, as a second place to prepare food and eat on the upstairs back patio. The house also has a washer and dryer in the unit to handle any laundry needs right from the home. The home itself has three parking spaces assigned to it, with two more in the back that work as first come first serve. The home is located just a short walk away from the neighborhood pool, and has its very own private beach access for you to enjoy during your vacation. When you step into Clair de Lune at 27 Blue Dolphin Court, you know you are stepping into a vacation of relaxation and luxury. Book your vacation to Clair de Lune at 27 Blue Dolphin Court today!